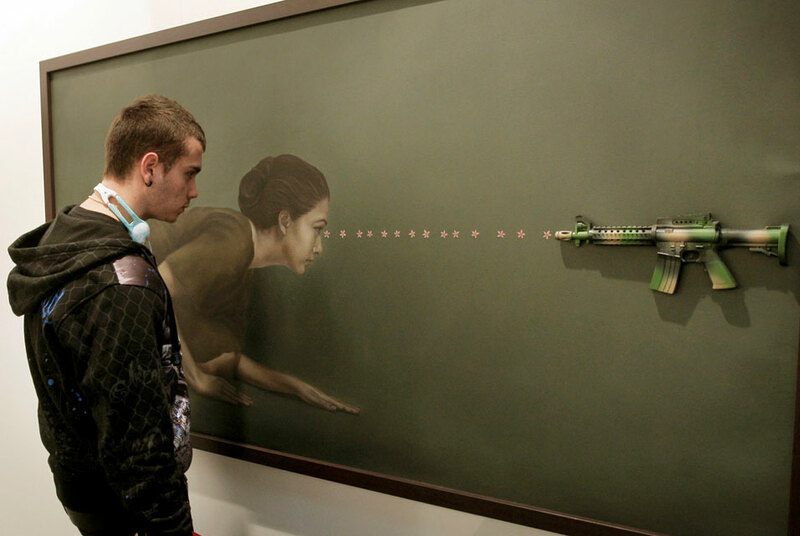 A boy observes the painting by Cuban artist Aimee Garcia Marrero at Arco-40, a section for young artists on the ARCO 2010 contemporary art fair in Madrid. EPA/EMILIO NARANJO. MADRID.- During the meeting held on October 4th and 5th last, the ARCOmadrid Organising Committee selected a total of 141 galleries for its General Programme and ARCO 40. These will be joined by a further 38 galleries who will be featuring in the various curated sectionsFocus Russia, Solo Projects: Focus Latin America, and Opening: New European Galleries. On Thursday November 18th, following the meeting of the Appeal Committee scheduled for the beginning of the month at which the list will be finalised, IFEMA will hold a press conference to present the galleries exhibiting at the fairs 30th edition, taking place in Madrid from February 16th to 20th 2011. The most notable new feature for the upcoming edition is the reduction in the number of galleries taking part, with the idea of creating a more compact event suited to the current moment in time, while at once creating a space more conducive to exchange and professional contacts, and the achievement of galleries business targets. Of the total number of galleries selected, 111 galleries will be taking part in the fairs core General Programme, showing work ranging from the historical avant-gardes and contemporary classics to the art of today, as well as a further 30 galleries selected for ARCO 40, the subsection of the General Programme in which galleries present work by a maximum of three artists made over recent years. Taking a look at the curated programmes, there will be 8 galleries in the FOCUS RUSSIA section, chosen by Daria Pyrkina, curator of the National Centre for Contemporary Arts and a professor at the Lomonosov Moscow State University. Instead of a separate section, these galleries will be strategically mixed in among the galleries in the General Programme in order to encourage greater interaction within a professional framework. Besides the galleries, this section also includes 6 institutions from Russia, as well as an exciting programme for Russian collectors. At the same time, the SOLO PROJECTS: FOCUS LATIN AMERICA section, open to emerging Latin American artists, will be represented by 15 galleries chosen by the Brazilian freelance curator Luisa Duarte; the associate curator at Museo Tamayo, Mexico City, Daniela Pérez; and Julieta González, associate curator of Latin American Art at Tate Modern, London. Meanwhile, the OPENING: NEW EUROPEAN GALLERIES section will feature 15 young galleries from Europe which have been open for less than eight years. The process of selection for ARCOmadrid_ 2011 is being coordinated by Maribel López, a former gallerist and freelance curator. ARCOmadrid is also planning a space for debate around the hottest issues concerning creation and the art market. The idea behind the Forum is to act as a meeting point for the international art community, a place where renowned experts can exchange views and projects, interact with exhibiting galleries, and expand their network of contacts. A platform open to the public, the Forum will provide an unique opportunity for analysis and debate on issues concerning collecting and Russia. The first of these two issues will be explored in depth in two roundtables featuring a number of major collectors. The debates The Collection, Myself, the World, and Expanded Collections, will be chaired by Rosa Martínez, former curator of the Venice Biennale and other major exhibitions. Meanwhile, a series of lectures on Russia have been programmed, to be chaired by Daria Pyrkina, with the participation of intellectuals, artists, philosophers and foundations. A new introduction this year are the six Professional Encounters scheduled during the fair. In each one, an art world expert will invite another 15 to 20 colleagues to a private meeting where they can exchange views and projects while also having a chance to visit the fair and interact with galleries. The planned encounters are: Producing Artists Work, with Chus Martínez, chief curator at MACBA Barcelona; Curating Emerging Artists, directed by Latitudes, the independent curatorial office founded by Mariana Cánepa and Max Andrews; What Images Today? with Marta Gili, Director of Jeu de Paume, Paris; Biennale Break, directed by Adriano Pedrosa, freelance curator; Latin America, organised by Hans Ulrich Obrist, Co-Director of Exhibitions and Programmes and Director of International Projects, Serpentine Gallery, London; and MNCARS, with Lynne Cooke, deputy director for Conservation, Research and Diffusion at MNCARS, Madrid. Once again, ARCOmadrid_2011 will turn Madrid into a world capital for the contemporary art scene in the month of February, and will consolidate the Spanish capitals reputation as one of Europes great cultural cities. Museum of Contemporary Art, Chicago, Presents Retrospective "Urban China: Informal Cities"